He’s the breed of legendary loyalty made famous by the movie “Hachiko” — 3 year old, 55 lb. 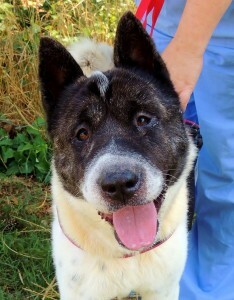 Akita mix “Sporty B” embodies the attributes which made his Akita ancestors a national monument in their native Japan. Sporty’s dignified, mannerly, and independent, a courageous guard dog who’s patient with kids and excellent on a leash, and his purpose in life is to form a single-minded bond with his beloved forever family. Sporty listens well and would be a dream to train, he’ll already “sit” for a treat. Akitas are known to be dominant, so Sporty should be your only dog — cats however, are fine. Come meet the most exciting friend you’ll ever find, and enjoy devotion that’s truly a breed apart. 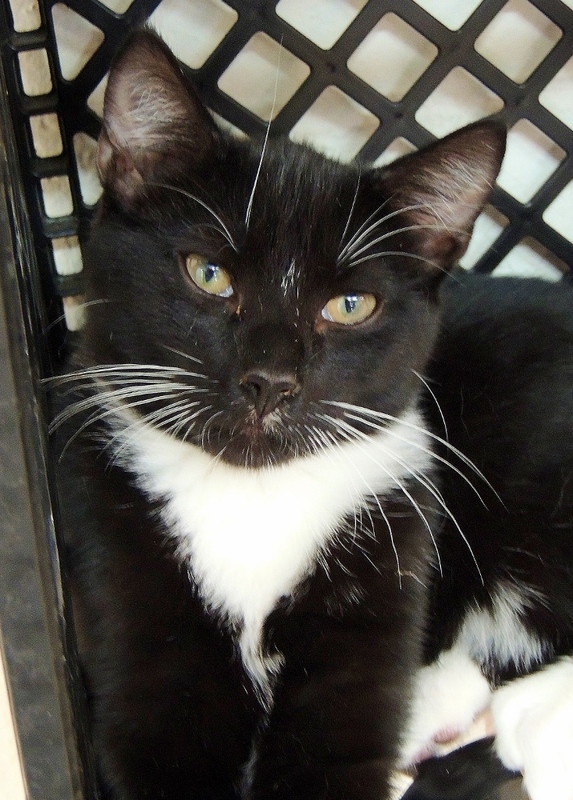 He was trapped when tiny at a lakeside feral colony, but 3-month-young Pierce is quite the opposite of wild; he’s so innately refined he was born in a Tuxedo, and his cheerful, humming purr and snugly face rubs will chase any doubts about his love for humans. (He’ll be shy for a moment, then his lap cat instincts kick in, and he’s as calm and comforting a friend as you’ll find). 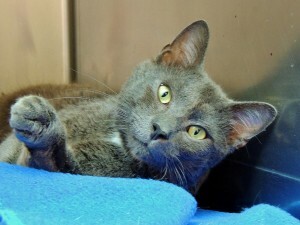 Pierce is good with other cats, gentle with kids, and gets along happily with well- mannered dogs, too. He could be a fine house feline who’ll never need to dress for dinner, or live inside/outside as long as you’re available for a serious affection-fest, with purrs aplenty and some soft kneading, too. Pierce’s already neutered and ready to go home today, come and be caught by a warm companion in formal wear. At 3 years old and 55 lbs., Retriever mix Nova’s destined to be the brightest family dog in your galaxy; he’s so perceptive he’ll run and romp with the big kids, then walk ever so carefully around a little child; so cooperative he refuses to potty in his run, and returns to his kennel on request. Nova’s white-tipped tail never stops wagging and he gives kisses the moment you ask; hug his neck and he’ll rest in your arms. 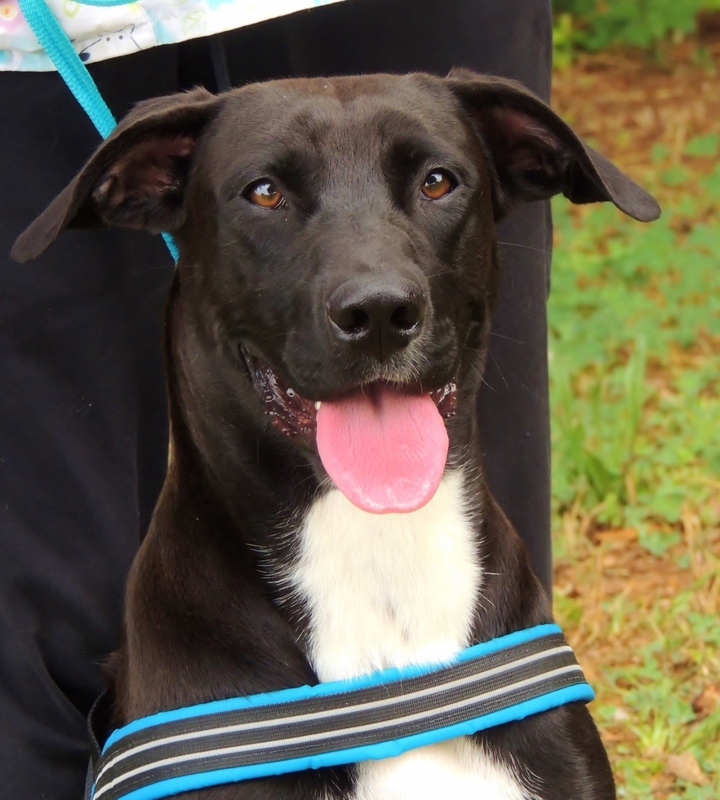 Nova gets along great with other dogs, is good on a leash and would love the lake, but will settle into a baby pool with a gracious white-toothed smile. Come embrace a match made in heaven, your new son Nova is here. to grace your home today. Come meet our delightful boy in blue-gray, and let your colorful friendship begin. 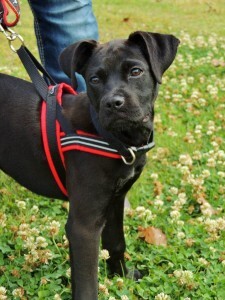 Her name’s “Twinkle” because she’s a little star — a 19 lb., 5-months-young Boxer/Retriever mix who’s a shining example of combined breeds creating a stellar family dog. 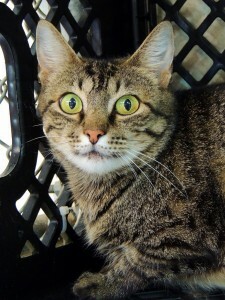 Twinkle’s femininity shines nonstop, so does her warm friendship for kids and others dogs — even cats. Twinkle listens well, is good on a leash and can sit for a treat; she’s perceptive, playful, gentle (her mouth is like velvet) and cooperative. 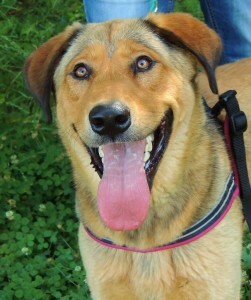 Adopt her now and teach her your family’s ways, she’s treat-motivated and would be a dream to train. See how many kisses and wags this little star has to give, and let Twinkle light up your world. celebs are already fixed and microchipped; take 1 or 2 home today, and enjoy a forever-fan club of your very own. Where he learned his enviable manners is the utmost mystery; one-year-old Shepherd mix Diesel was found stray, but he epitomizes the intelligence, loyalty and trustworthiness for which shepherds are revered. At 70 lbs. he’s glowingly handsome, a tall, gentle, boy who delighted the kids at Camp Good Dog with kisses and full-body-wags. Diesel’s a fun friend to other dogs; he loves romping the yard and dunking his head in his water bowl, but enjoys listening and learning just as much (he can “sit” for a treat and is great on a leash, too.) Come write your own ending to the Diesel mystery; he’s already neutered and ready to be a proud part of your family story. 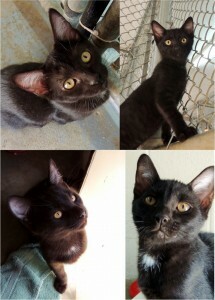 second family to our one and only Kitty.